Every living sports fan in Philadelphia, young and old, knows just how much the Phillie Phanatic means to the story of baseball in this town. An indescribable goofball and mischievous varmint changed the way we connect with our team, comedically kindling a ballpark's worth of magic that has lifted faithful crowds to their feet for nearly 40 years. Nothing to date better captures the cast of characters who brought us this fine specimen of Galapagosian descent than the documentary just released by Sports Illustrated Now. Everything you ever wanted to know about the birth of the Phanatic — like how Mike Schmidt used to loathe him — is here to keep you smiling and heading out with friends and family to Citizens Bank Park. 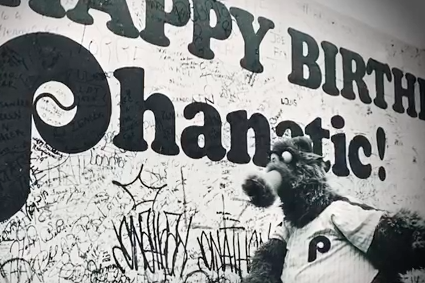 Without further ado, we also present a montage of some the Phanatic's greatest moments. Check in at PhillyVoice any time for complete Philadelphia Phillies news and coverage.